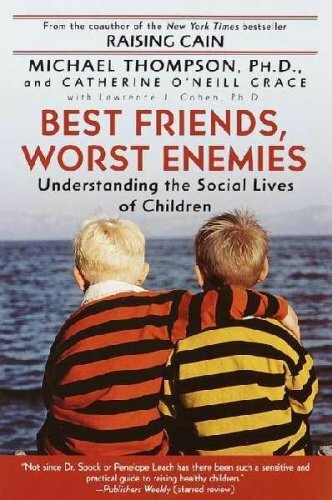 If you want to understand the basics of what friendships look like and how they change as kids get older, read the chapter on featuring a developmental tour of children and friendships. It clearly explains what is expected from friendships at the different ages and stages. If you want to understand the importance family plays in establishing a baseline for friendships and social lives, then focus on the chapter about secure attachment. While the authors focus on attachment, they also recognize that every child has their own personality and temperament and that also plays a role in how they interact with the world. I found the group dynamic chapter extremely helpful in explaining how children and teens behave in a group together. Everyone is subject to the laws of group life (be like your peers, you must belong to a group, be in or be out, find a place in the social hierarchy, you must play a role), and that “good kids” are responding to the same principles as “bad kids”. It makes sense to think about universal laws rather than labeling kids as always “bad” or always “good”. The chapter on social cruelty is really interesting, they discuss five types of kids (popular, accepted, rejected, neglected and controversial kids). The book reinforced what I’ve thought, that we should be focused on the bystanders when trying to help manage bullying. I think for parents the most important chapter is the last one - “What Parents Can Do”. All of their recommendations make a lot of sense. They use the analogy of being a lifeguard - “aware and engaged without being anxious”. They recommend that parents be a good friendship model and teacher - have conversations with your children about friendship, define what it means. Their recommendation to provide a range of opportunities is smart. What works for one child may not work for another. Some kids just aren’t into competitive sports, so you might want to either find a team that is less intense and understands your child’s needs, or find other activities like karate, tennis or yoga. Ask your child what they are interested in and see if you can find something. There is a lot of good information in this book, however you might want to focus on the chapters that matter the most to you and what is going on with your child at the moment. If you want to get a general understanding of the social lives of children, this is a great book to read. Encourage Play, LLC is a participant in the Amazon Services LLC Associates Program, an affiliate advertising program designed to provide a means for sites like this one to earn small advertising fees by advertising and linking to amazon.com.